Pu'u Ka Pele lookout, which is a very small pullout near mile marker 13 on Highway 550, provides an interesting angle into Waimea Canyon through a narrow gorge. The lookout also provides the closest (though partially obstructed) view of Waipo`o Falls from Highway 550. You're still a remarkable distance away from the falls, but it's a beautiful photo opportunity. A better lookout for Waimea Canyon is Pu`u Hinahina Lookout which is just beyond Pu`u ka Pele lookout at mile marker 13.5 or the official Waimea Canyon Lookout near mile marker 10 on Highway 550. Our featured listings are some of the best Waimea Canyon Tours you'll find anywhere- from full-day hikes, family-friendly sightseeing tours, and spectacular helicopter tours that'll have you soaring right into this geologic marvel. These tours stand out for their exceptional guides, unique experiences, and their focus on highlighting what makes Waimea Canyon truly shine. Book your adventure today! Make a great adventure even better by being prepared for anything you encounter along the trail. From great hiking boots, adventure cameras, Hawaii guidebooks, and more, we have a wide variety of hiking gear and travel supplies you'll need. 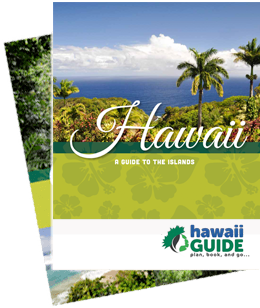 Browse our selections, pick up what you need, and be safe, comfy, and well-outfitted with Hawaii Guide. Mahalo!